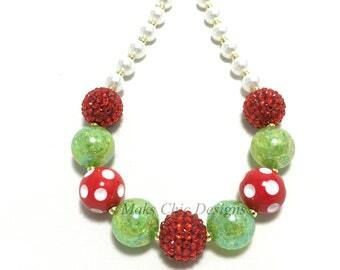 Girls classy chunky beaded necklace! 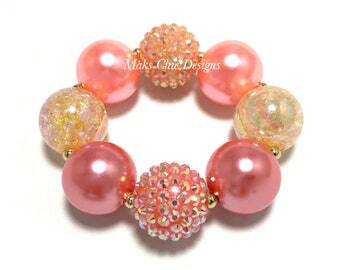 Made with coral, pink-peach pearl chunky beads, cracked champagne chunky beads, coral & peach rhinestone chunky beads and small ivory pearl beads. The spacer beads and toggle clasp are gold tone . Item will be placed inside an organza jewelry gift bag and then carefully packaged to prevent any damage to the beads. I do my best to triple check that every item is sealed and secured. 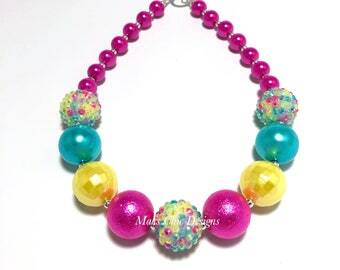 These chunky beaded necklaces are considered a choking and strangulation hazard to children under the age of 3. Young children should not be left unattended while wearing this item. Its best to keep necklaces/bracelets free from water or harsh chemicals. It may fade over time is not cared for. Beautiful bracelet for my older daughter! She loves seashells & pearls so it is perfect & she can wear it to her sister’s mermaid party next month! Thank you!! The custom necklace matches beautifully with the bracelet! They are perfect for my daughter ‘s mermaid party next month! Thank you!! Beautiful bracelet!! I can’t wait for my daughter to wear it for her mermaid party next month! Thank you!